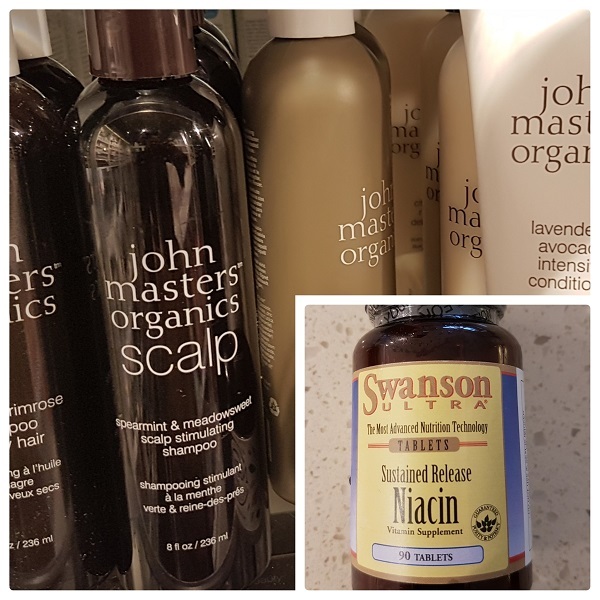 For anyone wanting to encourage strong and healthy hair growth post chemotherapy (or just generally) I have 3 great tips for you! I have had so many people (including my hairdresser!) comment on my thick and healthy hair, I felt it was only fair to share my secrets with you. The second is to switch to a silk pillowcase. The natural properties of silk help to keep bedhead at bay by reducing friction which can in turn cause damage. As an added bonus, silk is great for the skin and has been shown to reduce crease wrinkles. Many dermatologists also recommend the use of a silk pillowcase. And finally, the third and most exciting tip, which I came across by accident. I started taking a B3 supplement to help with energy, mood, cognition, skin… and lots more besides! Following a dose of the B3 (Niacin) I would experience a “hot flush”. Mainly in my face and tingling in my scalp. This is due to increased blood flow to the scalp area, which in turn brings more oxygen and nutrients to the hair follicles. This equals hair growth! Yay! If you do try any of these…let me know how you get on!